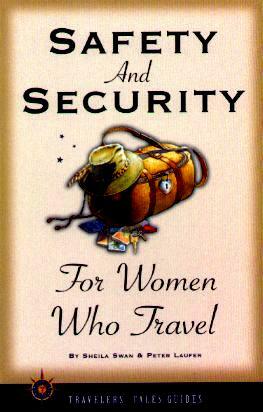 This is a very necessary read prior to departing on your travels. Authors Sheila Swan and Peter Laufer have put together loads of helpful hints about dealing with unfamiliar situations, and cautions, like keeping your documents safe, what to do if you get into an accident, need medical assistance, if you want a car, or, when you do cash withdrawals at ATMs. These hints and tips are predominantly aimed at foreign travel and when perhaps you don't speak the language, but, many things should be practiced at home on a daily basis. Things happen anywhere, anytime, so by being vigilant by nature will probably stand you in good stead. No one likes their vacation spoilt by pickpockets, carjackers, lost luggage, stolen money, etc., so by taking as much care as possible beforehand, could save you much aggravation in the long run. There is a handy 12-page note section at the back of the book to jot down pertinent points or new things you think of while on your travels. I did find the additional things suggested you take along to be a bit excessive. I hate taking too much stuff. Conclusion - Very useful especially since we all have to be more vigilant, wherever we are.